This set of adorable Big Eyes plush turtles will encourage nurturing play as your child interacts with these sweet critters. Baby turtle can ride along in a special pouch on Mommy's (or is it Daddy's?) shell, which then lies flat when baby turtle is removed. 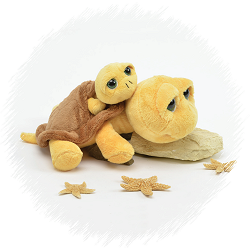 Both stuffed turtles have cuddly yellow bodies with brown shells that are wonderfully soft to the touch. With big green eyes and sweet smiling faces, these turtle stuffed animals are out to inspire hours of imaginative, huggable fun. Zippy is an adorable plush turtle with soft green fur and an inspirational message of I Turtley Love You.